Physicist Chad Orzel talks to his dog. This is not all that unusual. Many pet owners talk to their pets and dogs make particularly good listeners. What might be a little strange is that Professor Orzel talks to his German Sheppard mix Emma about quantum physics. It turns out that dogs have a good intuitive grasp of quantum physics so they are able to have long conversations on quantum physics. 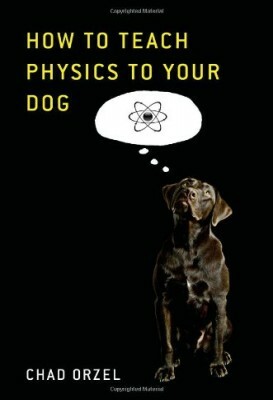 In How to Teach Physics to Your Dog, Chad Orzel relates these conversations in which he explains to an eager Emma the basics of quantum physics. Emma interrupts his explanations with just the sort of questions the reader might happen to have. The dog and physicist talk about such topics as the uncertainty principle, virtual particles, quantum tunneling and entanglement. It’s a fun idea and Chad Orzel does a terrific job explaining physics to the lay reader in the guise of talking to his dog. He seems to have a good feel for how a dog acts and thinks, and I have no trouble imagining that if a dog could talk about physics she would be just as excitable, and as easily distracted by squirrels, bunnies, and treats. The most important chapter in this book must be the last one, Beware of Evil Squirrels. Here Professor Orzel warns the read of the misuses and outright scams involving quantum physics. There are any number of con artists and New Age frauds who make use of scientific sounding terminology to mislead their victims into believing that one can get free energy from “vacuum energy” or heal oneself of all diseases by imagining oneself to be perfectly healthy. As Orzel explains, despite the many weird and wonderful manifestations of quantum physics, it is not magic, and follows the same sort of rules as anything else in the universe, including the common sense rule that if it sounds too good to be true, it probably is. I found How to Teach Physics to Your Dog to be appealing and informative. I think that some of the explanations were a bit hard to follow but that is perhaps more my fault than the writer’s.